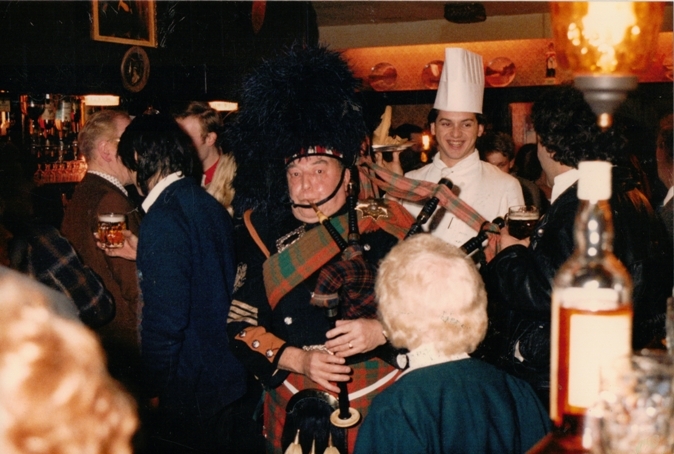 Below Pipe Major Peter Whitwam piping the Haggis through Johnny's Disco, The Palace Bar, and Rosemary Lane Bistro celebrating Robbie Burns Night. 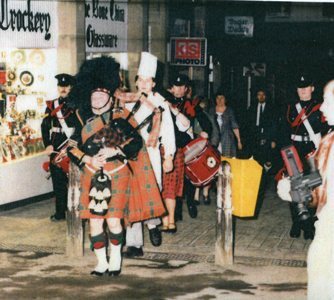 Johnny first met Peter when Peter formed the Huddersfield Pipe Band in the 1950's. 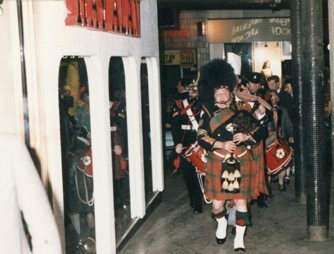 Johnny was a drummer in the Duke of Wellingtons Army Cadet force and Peter asked him to attend a few band practices in Fitzwilliam Street. 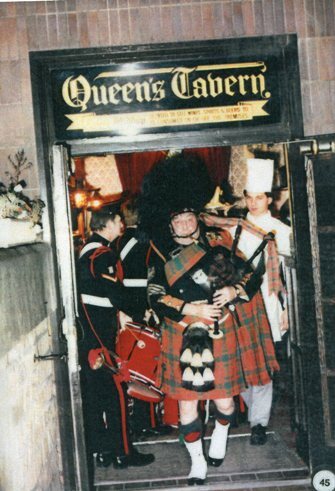 I was very thin in those days and when after a few weeks the Tartan kilts arrived I was too embarrassed to wear one and returned to the Army Cadets. 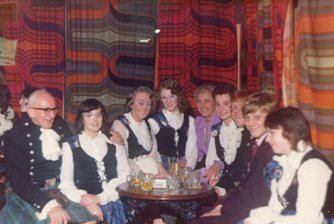 However I had met a gentleman in Peter who would become a life long friend and from the early days and for many years Peter would pipe for us at the club yearly on Burns Night and on New Year's Eve in the disco. 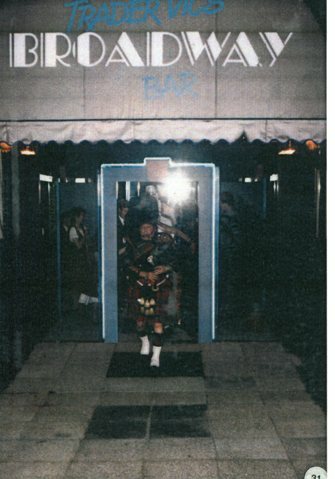 I am sure many of you will remember Peter. 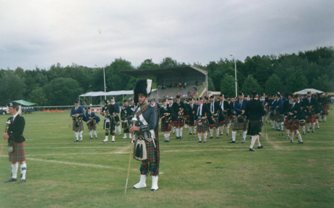 Sadly Peter passed away in January 2009. 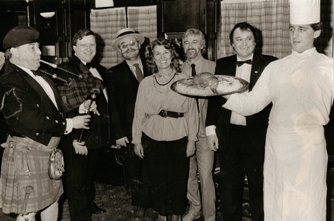 A great family friend and a true gentleman. 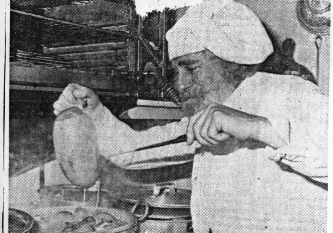 chief chef Johnny Bedford. 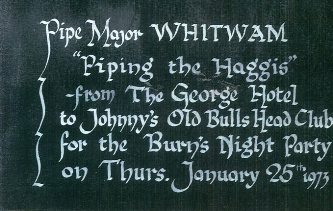 The event was the ninth annual Burns Night celebrations where the haggis was piped in by Pipe Major Peter Whitwham and addressed by Mr Rabbie Thompson. 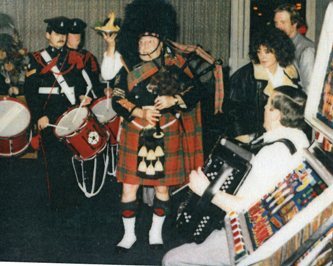 Entertainment was provided by Stanley Varley's Scottish Country Dancers and Johnny's Honky Tonk Jazzmen. 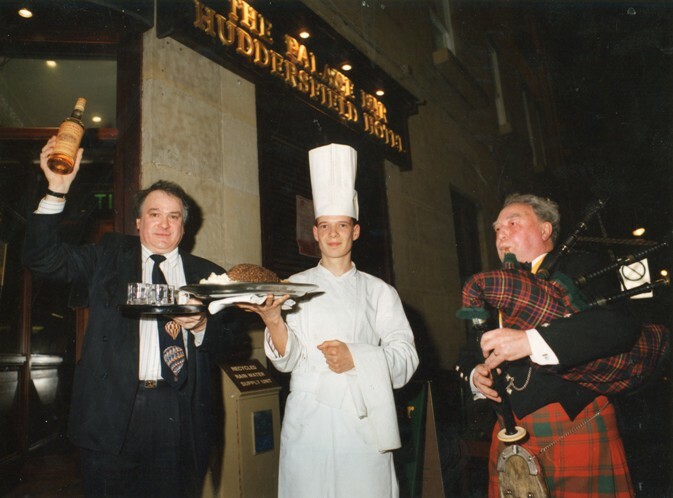 Haggis, neeps and tatties were on the menu of a Huddersfield restaurant today. 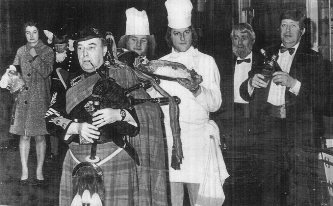 Pictured this morning - in keeping with Burns Day tradition - the first haggis is carried by head chef Denis Clark, being ceremonially piped into the Rosemary Lane Bistro by Mr Peter Whitwham. 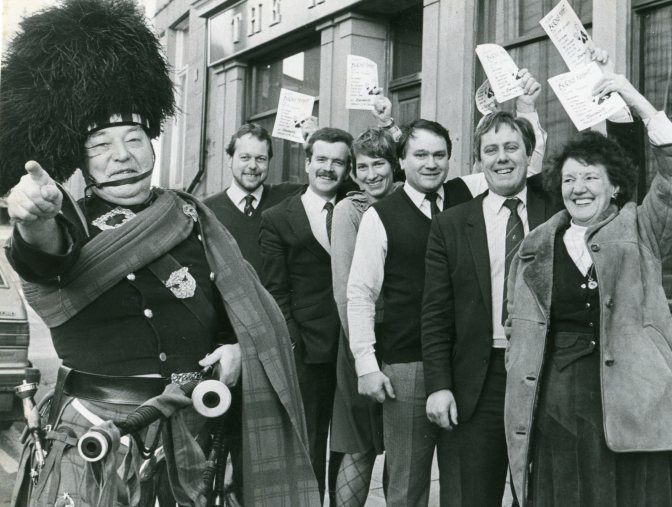 Celebrations to mark the birthday of Scots poet Robbie Bruns will continue all week at the Bistro, ending Monday with a party at Johnny's night club. 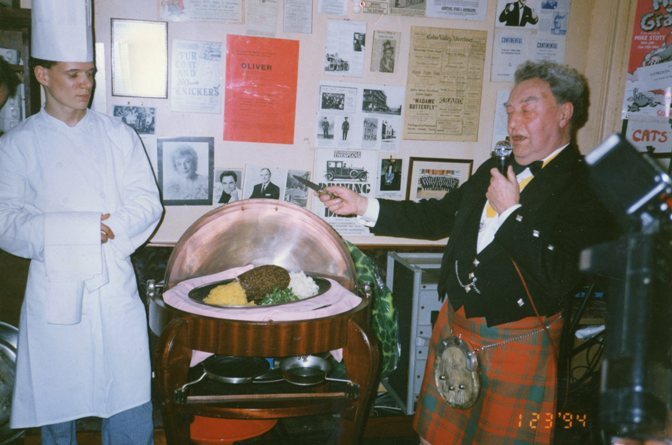 The owner of the two establishments, Mr Johnny Marsden, said that he had bought 200lb of haggis from Scotland. 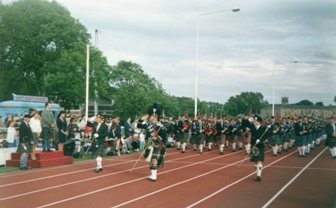 Mr Whitwham, who has played the bagpipes for 26 years, is a former Pipe Major with the West Riding County Fire Service Pipe Band and a founder member of the Huddersfield Pipe Band. 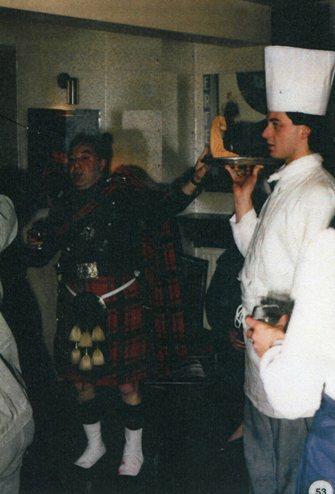 Below Johnny and Peter piping the Haggis around town centre pubs and bars on their way to Johnny's Nighclub. 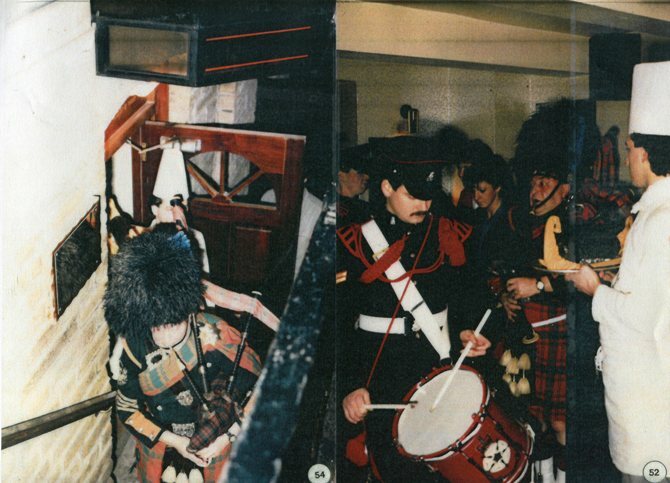 Accompanying them are band members of the local Territorial Army and Scottish accordianist Mr Frank Gillespie. 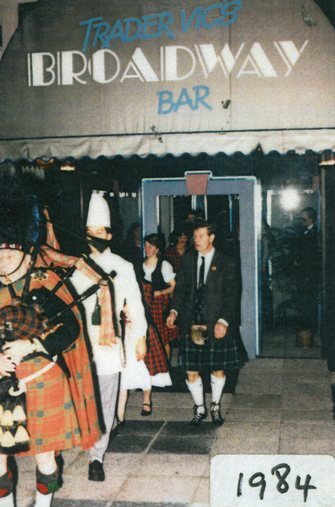 from the George Hotel to Johnny’s Nightclub. 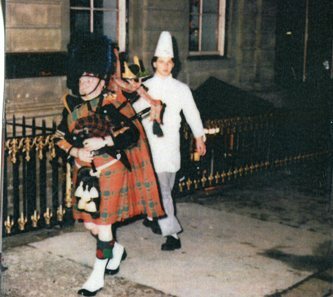 the platterful of steaming food along John Williams street and down Kirkgate to the disco for the start of the Burn’s Night celebrations. 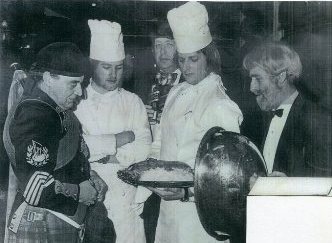 were carved up and served to the members. 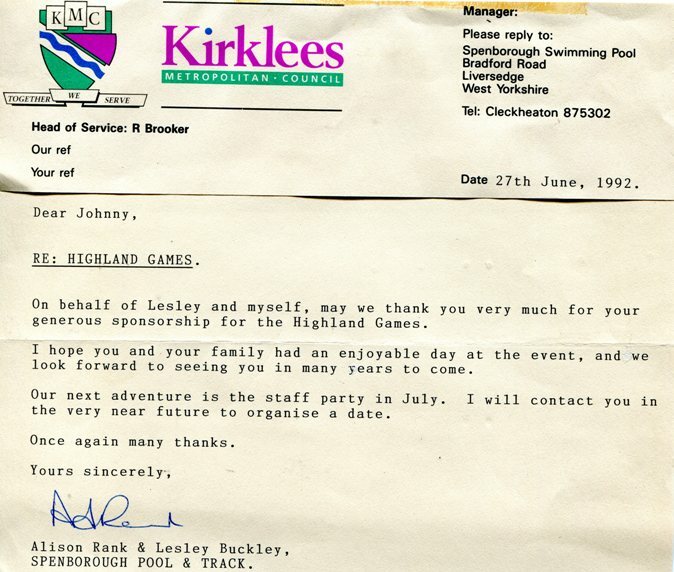 will go to the Huddersfield Kidney Unit fund. 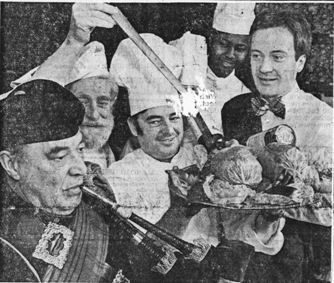 Seen at the piping of the haggis are (from left) Pipe Major Peter Whitwam, Mr. M. Kaye (commis chef), Mr. G.Whiteley (Head Chef). 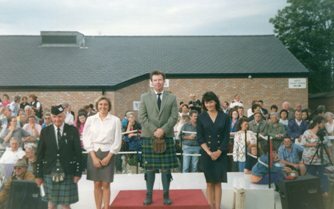 Pipe Major Peter Whitwam addressing the Haggis with a Robbie Burns poem. 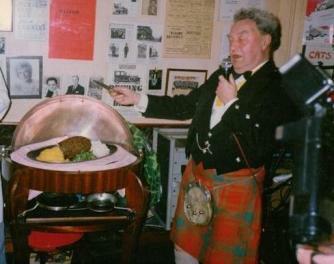 The haggis can be seen with neeps and tatties at either side. 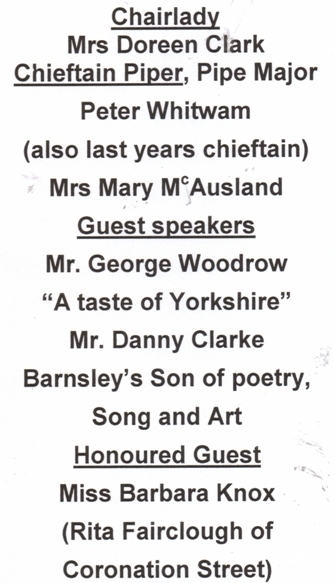 The honoured guest was Miss Barbara Knox (Rita Fairclough off Coronation Street). 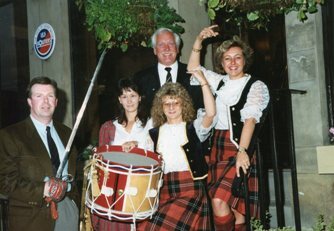 Musicians who played at the Palace Bar, throughout last summer are pictured at a Burns Night party, held in recognition of their help. 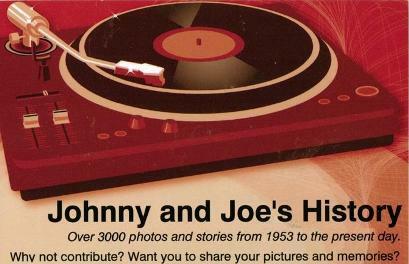 More than 150 people comprising brass bands, skiffle groups, jazz musicians and ukulele players attended the function. 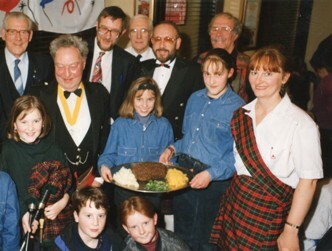 Pipe major Peter Whitwam addressed the haggis and traditional Scottish food of tatties and neeps were also served.